German automotive giant Daimler and UK engine manufacturer Rolls-Royce have teamed up to bid for German engineering group Tognum. The joint venture will offer 3.2bn euros ($4.4bn; £2.7bn) for the engine and turbine maker. 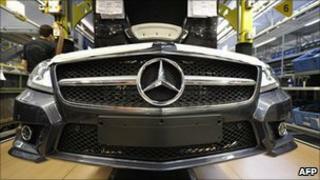 Daimler had already announced it was in discussions with Rolls-Royce over a possible bid. The group, which owns luxury carmaker Mercedes Benz, already owns a 28% stake in Tognum. This will be placed into the 50:50 joint venture, while Rolls-Royce will contribute its Bergen engine business. In a joint statement, the new partners said they intended to maintain Tognum's manufacturing sites and were confident that their growth strategy would secure jobs. They also said a deal would strengthen their access to emerging economies. Analysts suggested the two partners might have to increase their offer to convince Tognum to sell. Dr Dieter Zetsche, Daimler chairman, said: "Tognum is an excellent company and the combination with Daimler and Rolls-Royce creates a win situation for all parties. The planned combination will provide a strong platform to realise the huge market potential". Rolls-Royce chief executive Sir John Rose said: "The complementary capabilities we are bringing together will provide us with a world leading proposition." Tognum is listed on the Frankfurt Stock Exchange.